FET Booster Pedal, Guitar/Bass booster from Flynn Amps. The latest addition to the Flynn Amps range of guitar booster pedals is the new FET booster. 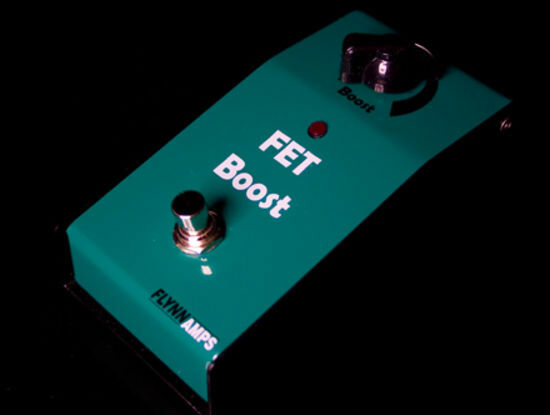 The FET booster is designed to preserve your guitar tone while providing loads of pure clean boost with just a touch of FET shimmer and detail, according to Flynn. The Flynn Amps FET booster is an ideal solution for guitarists that would like the dynamic range of a classic treble booster design but have an amplifier that doesn't suit the high frequency output of those devices. 9v Negative earth dc input. Extremely high impedance input won't load your guitar pickups. For more information, visit www.flynnamps.co.uk. Vox AC30C2 Vox Amplification has updated its classic AC30 and AC15 guitar amplifiers to create the new Custom Series - Models in the new series include the AC30C2X, AC30C2 and AC15C1. Catalinbread WIIO The WIIO is an overdrive, which, according to the manufacturer, is inspired by the "powerfully unforgiving British amps from the '70s." T-Rex Engineering Tonebug Distortion T-Rex showcased its Tonebug Distortion pedal at the NAMM show last month.